January 1, 2011 — Concerning Virgil Thomson, Leonard Bernstein was right when he said, "He is a son of the hymnal." Listening to this recording, that seems like a severe limitation. His melodies remain almost structurally naïve, akin to the more unsophisticated guitar hymns that arose once the vernacular replace Latin in the Catholic Church; their melodies sound like the notes of arpeggios with awkward harmonizations. January 1, 2011 — For many (myself included), the music of Virgil Thomson (1896-1989) is an acquired taste. Originally I was rather put off by the harmonic simplicity (and occasional banality) of his dominant musical language – a language built almost exclusively upon simple hymnal harmonies and American folk rhythms. However, as the years have passed, I have come to deeply admire music of his work, and several pieces have become true favorites that I listen to often. January 1, 2011 — Virgil Thomson (1896-1989) is an American composer often talked about and referred to, but infrequently performed. The major record labels have pretty much ignored him, though smaller labels have done a reasonable job in representing his music. This disc, from the label of the Boston Modern Orchestra Project, is a significant addition to the Thomson discography. November 22, 2010 — RECOMMENDED The Harvard music department has certainly produced its share of distinguished American composers, including John Knowles Paine (1839-1905), Arthur Foote (1853-1937), John Alden Carpenter (1876-1951), and Walter Piston (1894-1976). But none was more influential than Mid-Westerner Virgil Thomson (1896-1989), who went on to study with Nadia Boulanger (1887-1979) in Paris during the 1920s. November 12, 2010 — For those who like to stump their musical friends with the old guess-the-composer game, a good puzzler would be "Sea Piece With Birds." This 1952 orchestral work, some four minutes of somber, heaving music, is thick with chromatic chords that move in big parallel blocks, with skittish atonal themes mingling hesitantly above. The atmospheric orchestral colors suggest strangely updated Debussy. A frenetic climax sounds like some ornery blast of Varèse. The composer? October 28, 2010 — The Boston Modern Orchestra Project is currently represented in the catalog on about 33 releases, most well-worth investigation by those interested in the trends of contemporary music, and good contemporary music at that. It is time they turned their attention to one of the most misunderstood and really neglected composers: Virgil Thomson—critic, pianist, organist, and often vitriolic pundit. At least that is what the composers of the atonalist school thought; though no one was completely free from his often dead-on and yet highly provocative verbal barrages. October 24, 2010 — Regular readers of this blog will know that one of my favorite singers is the baritone Thomas Meglioranza. 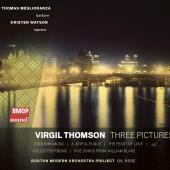 I'm pleased to report a new recording by Mr. Meglioranza of music for baritone and orchestra by Virgil Thomson on the Boston Modern Orchestra Project label. He sings the Five Songs from William Blake and The Feast of Love, and joins with soprano Kristen Watson in Collected Poems, a witty setting of words and phrases by Kenneth Koch.